The golden age of lute was the Renaissance: at that time, nearly every gentleman of the upper classes knew the instrument. Doctors would even have lutes available in their waiting rooms for patients to play while they waited. 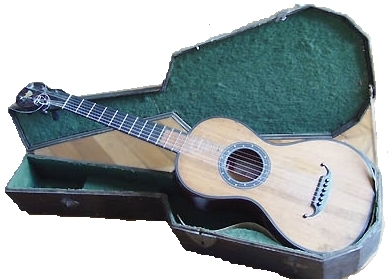 It is a fragile instrument, bearing tremendous pressure from the 24 strings, and quite sensitive to temperature variations: its strings may snap and its wood break, at the first hint of excessive dryness in the air. With no air conditioning at the time, it was not uncommon for these expensive instruments to be hidden and protected under a lutenist's covers. As you may guess, more than one unhappy musician remembered this fact a bit too late upon springing into bed. This is one of the many reasons for which so few original lutes were preserved: their fragility, and the disfavour into which their music had fallen, caused many of them to be burnt like logs. Why had lutes become so unpopular? Several theories exist: first of all, the instruments had become increasingly complex. Whereas during the Renaissance, any gentleman could play with ease, by the 17th century only a few specialists could master the newer lutes. What's more, musicians needed support from wealthy patrons to be able to buy their instruments, to maintain and repair them, and to have time to practice. Each lute is specific to its music: 'tis impossible to play Baroque music on a Renaissance lute. Last but not least, the difficult tablatura scripting method made the study of the music arduous, since the system, describing hand positions on the strings, would change from instrument to instrument! As a result, the lute was progressively abandoned in favor of the newer and easier violins, flutes, and other modern instruments. Louis owns five instruments in total, of which three lutes, an archilute and a theorbo, but his favorite is the Baroque Lute, which is tuned to d minor. This unique lute was custom-built for him, per his specifications, by the great Swiss lute maker Jacob Van de Geest. It supports 13 rows of courses (23 strings in total), allowing for incursions into 18th century German music, but is built on the model of a 11-course French lute, to which it owes its sonorous beauty. His lute sports gut strings, which today is customary for treble strings. But Louis is one of the only lute players to also use gut strings for basses, as was done at the time. Why is this so unique? Because today, gut strings found on the market rarely reach the quality required for bass strings. Thanks to research and unique procedures invented by lute maker Charles Besnainou, Louis furthered the research with hundreds of hours to perfect and create his own strings, ordering the raw materials and experimenting with techniques. Strings with metal, commonly used for bass strings today, have an too long resonance time; and gut strings commonly found on the market have a stuffocated sound which makes impossible a clear polyphony. Louis' strings, on the other hand, give a clear, relatively brief sound, which is exactly what 17th century music required, according to analysis of the tie signs. One is called "pre-baroque", sporting 10 rows of strings, set to the "old tone" in Sol Major. This lute, created by Mathias Duvie and retabled by Charles Besnainou, allows him to play Renaissance music. An Archilute was built for Louis by Jacob Van de Geest; it's the last instrument the great lute factor built before his death. This lute can also be set with the two first strings "swallowed up", thus allowing Louis to play pieces for theorbo solo such as those of Robert de Visée. Louis is one of the few lutenists today to play these pieces on theorbos with double rows. A theorbo, also constructed by Mathias Durvie and retabled by Charles Besnainou. Its diapason being greater than the Archiltue, it allows Louis to play solo pieces, and has more puissance pour accompagner en continuo.